Sheep scab was a serious stock health problem from the late 1840s. The disease is caused by the mite Psoroptes ovis, which lives in the animal’s skin. An ordinance passed in 1849 required the inspection of flocks. Sheep were treated by dipping in a solution of boiled tobacco water, sometimes with salt, saltpetre, sulfur or arsenic added. Scab was largely under control by the 1880s – mainly thanks to fencing, which allowed farmers to keep their stock separate from infected flocks. 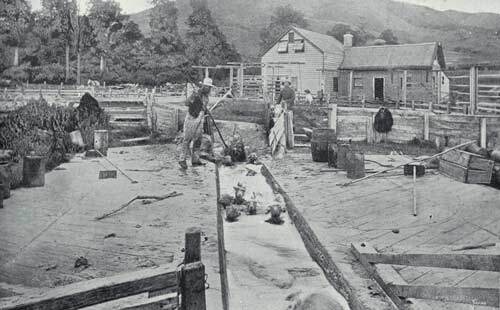 These sheep are being dipped at Ōrari Gorge Station in South Canterbury, around 1900.